FJ D.N.A. Women's Golf Shoes D.N.A. - DryJoys Next Advancement features the most comprehensive feature package ever delivered by FJ. D.N.A. footwear embodies the most proven elements of the world-renown DryJoys franchise with new, cutting-edge design and construction methodology. Features: Performance Leather ChromoSkinTM leather, developed by Pittards® of England, is a supple, lightweight and durable leather, offering two year waterproof protection. Athletic Design The SnugFit tongue with MicroVentTM technology shapes to the foot while providing breathability. A 3D FoamCollarTM molds to the ankle for unsurpassed support, comfort and fit. Extreme Comfort The lightweight cushioned Fine Tuned Foam (FTF) fit-bed provides optimum underfoot comfort and heel support. Superior Traction The NitroThinTM TPU outsole provides lightweight stability and performance. Stealth Cleats by Softspikes help to achieve a low profile while the thinner spec receptacles ensure low-profile performance through the P.I.N.S. system. 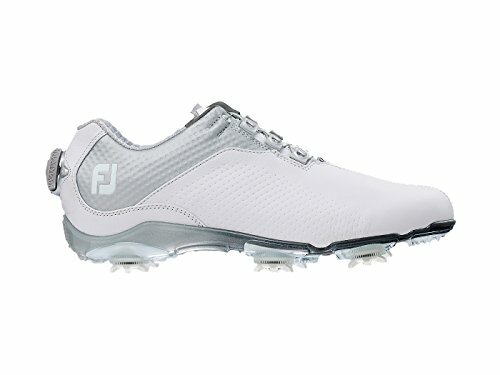 If you have any questions about this product by FootJoy, contact us by completing and submitting the form below. If you are looking for a specif part number, please include it with your message.